After a long but pleasant bus journey from Bangkok I arrived in Uban Ratchanthani where I was met by Lawrence the project leader. We went for a meal and chatted about the Thai Monkey Forest Project. I got a good feeling about this project and Lawrence straight away. After a genuine Italian meal, the last western food for a while, Lawrence drove me the hour long drive to Phana where I would be living and working for the next few months. Pensri, Lawrence’s wife, met us at the research centre and led us upstairs to the house which had been her original family home. Pensri is lovely; the research centre is great and the house upstairs well equipped and comfortable. Yes, this is going to work out great, I thought to myself. My room is a comfortable single room, spacious enough for my needs. The house has a fridge, hob and washing machine, plenty of books and comfy chairs, what more could you ask for. The following day was my first day in the forest. I was given a bicycle and a tour around with Lawrence. 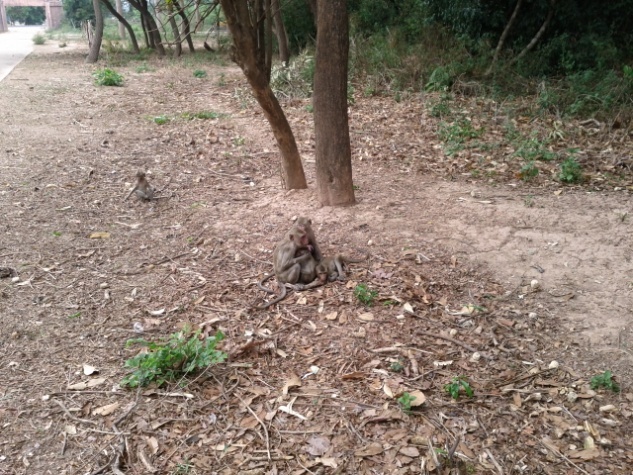 We went into the forest and I got my first experience of the Macaque population. What a pleasure to be in the forest with these entertaining, interesting primates. 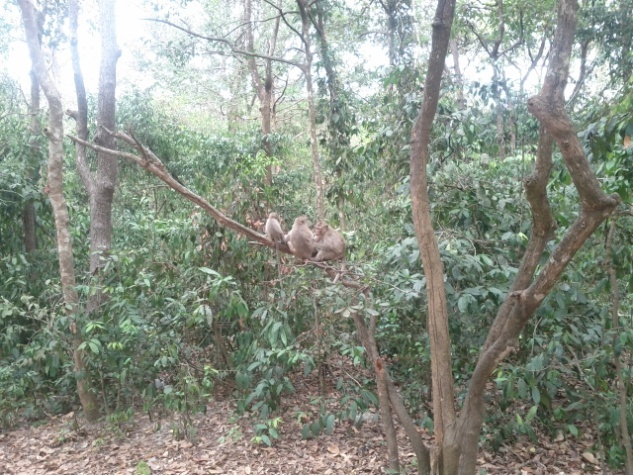 I am here at the project in a research capacity so I spent the next week or two acclimatising to the area, getting to know the forest and my daily duties of water provision, keeping the forest tidy and monkey feeding whilst looking into areas I could explore as a research project. After my first 4 nights as the only resident volunteer, Elizabeth, my fellow house mate, returned from a trip away. We got on well and she showed me round some of the local area such as the Green Restaurant and the Steak House (which isn’t actually a steak house but does occasionally have chips on the menu). We currently have two other volunteers here and often eat dinner together, play cards and watch films of an evening when not attempting Karaoke in Thai. 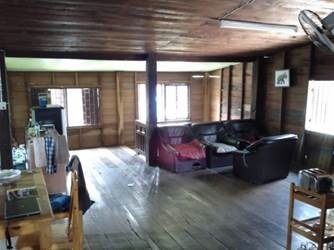 The project can accommodate around 7 volunteers: three in the research centre and others in home stay accommodation within the village. Some volunteers like Elizabeth and myself are doing research whereas others come to volunteer in the forest and assist with informal English classes for the local children which provides a nice mix of people. It is a peaceful, pleasant pace of life here in Phana and the locals are very friendly. Lawrence and Pensri are warm, kind, supportive people, with a wealth of knowledge for whom it is a pleasure to work. I am enjoying my time here and will probably be here for 2-3 months. The research I have been doing I hope will serve as a preliminary study for my Master’s thesis next year. Pensri and Lawrence are keen to encourage research so along with their links to Exeter University in the UK and Mahidol University and Chulalongkorn University here in Thailand other connections are welcome. To that end we are expecting two Masters’ students from Exeter arriving within the next couple of weeks to do research projects and a PhD student from Japan investigating osteophytosis in Macaques. It is an exciting time to be involved in this project which is full of potential, the simple pleasure of being around the monkeys and experiencing rural, local Isan life.